Paso Robles police responded to a home on Green Court and found that 32-year-old Troy Allen Sykes and a woman had been shot. Both victims were transported to the hospital and are expected to recover. 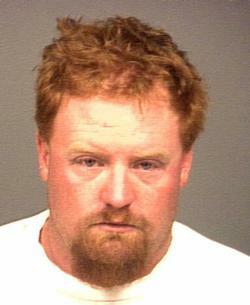 Sykes was charged with two counts of attempted murder and booked into the San Luis Obispo County Jail. More bloodshed is not the way to handle d.v. There are laws in place to protect people from d.v. It is unfortunate that domestic violence is not taken seriously until a person is shot. Where is the story about any r.o. violations and past arrests? It’s too bad the cops didn’t ‘accidentally’ shoot this guy between the eyes when they arrived on the scene. This guy needs to get out of the gene pool. Bert you should watch your mouth! After all the legal proceedings are concluded, how long will it take before the court in its wisdom orders visitation between this man and his child? Court ordered child abuse. Supervised visits? Still abuse. Sure, he was probably under the influence, like that’s an “excuse”. Sure, he was not after the child, just the child’s perception of life itself – his mother. When will we take domestic violence seriously? Just a wee bit curious. To what do you object? That he was under the influence? That it might be used to excuse his behavior? That the child was not a victim? That going after the mother is not harmful to the child? That killing a mother makes no harm to the child? That attempting to kill the mother makes no harm to the child? That a mother does not represent life to the child? That the mother’s life lost might hurt the child? That Mr. Sykes did no harm? That the mother is really the harmful person? It is really the mother fault that Mr. Sykes broke into her home at 6godawfulam? That it’s normal to come on over at 6a-em with a gun/heck I do it all the time? That domestic violence is exaggerated here? That it was not domestic violence, she just was unreasonable when he came over at six-a-em? What is it you object to?